Cha Wang (Tea King) is our highest grade Tai Ping Hou Kui tea, where only the finest and perfectly crafted tea leaves are selected. This tea has won many awards, the most recent being the "King of Tea" award in China Tea Exhibition 2004. 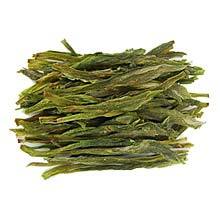 Our Cha Wang Tai Ping Hou Kui is from Hou Keng village, located at the foothill of Tai Ping county. In the same way that Xihu area is known to produce the best Long Jing, Hou Keng village is where the highest grade of Hou Kui is produced. The taste is wonderfully complex. It has a smooth mouthfeel, taste nutty at first sip and the sweetness of this tea slowly reveals itself as you continue to drink it. The liquor also has a lingering, sweet aftertaste with a hint of flowery overtones. The tea leaves are fully hand-crafted and truly a sensational work of art. They are huge, flat and have criss-cross pattern on them. The reddish color on the stem (one of the known characteristic of this tea) is also very apparent on our Cha Wang Tai Ping Hou Kui tea leaves. Only similar size tea leaves are selected and then perfectly crafted until they can easily stack on top of one another.